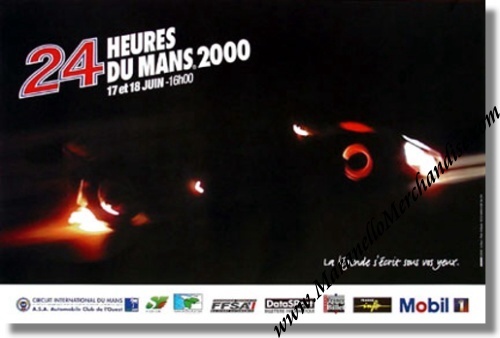 2000 Le Mans Race Poster. June 17 & 18, 2000. The race was won by Frank Biela, Tom Kristensen and Emanuele Pirro in their # 8 Audi R8R-2000 with a total of 368 laps to their name. This poster is part of the "Mythic inspiration of the race" era. Color photo by M. Miyaka. This poster caused the most fuss in the history of the event! It is the official poster, created shortly before the race to replace the posters that were withdrawn because of their negative and confusing content. This original illustration enables the viewer to guess that there is a car on the track merely by its lights alone. It is a strong image that reinforces the myth and legend of the 24 Hours. For the full results of this race, please see 24 Heures du Mans results 2000.